Amy Silverstein discovered that the donor heart that had beat for 26 years was failing. If she didn't get a new heart quickly, she would die. Amy and her husband send their son off to college and then pack up their life and move across the country. The best cardiac care is in California and Amy is hoping for another heart and some more time. But her friends won't let her face this alone. Nine of them create a spreadsheet and put their own lives on hold to sit by Amy's side in her hospital room. 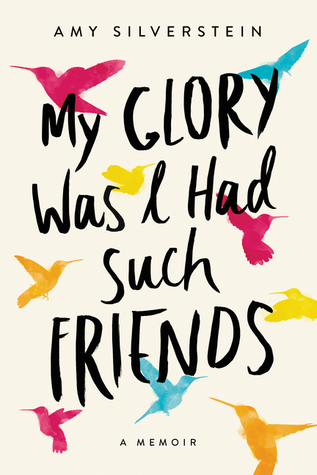 My Glory Was I Had Such Friends is the story of one woman's search for another heart and a reminder of the strength of friendship in the darkest moments. In a single book, Amy Silverstein can help so many of us who don't quite know what to do in times of crisis. It's easy when someone is grieving or facing a lengthy hospital stay to panic because we aren't sure what the right or helpful thing would be. In My Glory Was I Had Such Friends, we are presented with a group of people who don't always do the right thing. Sometimes they say things that make Amy angry or even make her cry, but they showed up over and over again. I appreciated that Amy claimed ownership of herself and her illness. Because she has been through a heart transplant before, she knows how to advocate for herself. Sometimes this comes off as being pushy or even mean but, as Amy's friends have to learn, no one truly know what it is like to live inside Amy's body as it is dying. It was difficult to read and eye-opening when Amy started to think about refusing the transplant. After she prepared for a new heart and it fell through, she started to think about the daily agony she was experiencing and the toll it was taking on her loved ones as they watched her fail. In a culture that focuses so much on healing, it's important to think about what it would mean to die well when that time comes. This is a book I would recommend to everyone; at some point in our life, we will either be the one in the hospital bed or the one sitting next to it. Amy's story can help us know what to do in both of those situations to be the kindest friend we can be. It's also a beautiful testament to Amy's friends. She writes honestly about the ways they failed her and she failed them but, in the end, this book is a record of the power of our bonds. I would be honored if anyone ever wrote about me with the love and sincerity that lives on these pages. Sounds inspirational as well. Friends like these are hard to find. This sounds beautiful and emotional. I love books that focus on friendships.